600,000 years ago, when humans were migrating northward from Africa into Eurasian colder climates, a single-letter DNA switch–from a G to an A–proved to help humans brave more frigid temperatures. Stanford University researchers have found, however, that this genetic change has also brought decreased height and resulted in increased risk of arthritis 1.3 to 1.8-fold in Eurasian populations. Researchers at the Stanford School of Medicine and Harvard University recently published research that identifies and examines the specific DNA variant behind these perplexing selected-for, or favored, traits. The culprit? Mutations in GDR5, a secreting signaling molecule key to bone growth that controls where and when genes are expressed during development. 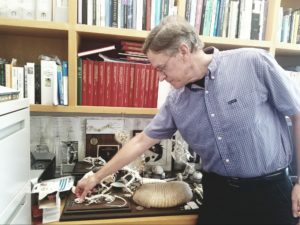 Dr. Kingsley, professor of developmental biology at Stanford and one of the authors of the study, began examining skeletal development more than 20 years ago by looking at growth stripes in mice joints. GDR5 first caught his interest as a key gene in terms of growth control and joint development because it shortened the feet and limbs of mice. In their recent study, Kingsley and his colleagues found that the gene, which shows strong signatures of positive evolutionary selection, is also associated with human height variation and arthritis risk. GDR5 is one of these regulatory switches lying close to crucial developmental genes that has contributed to an average of one centimeter of added shortness in billions of people around the world. In Japan and other East Asian regions, the allele frequency is more than 80 percent, and 6,000 years ago Neanderthals (who weren’t part of the original migration affected by this gene) flipped over to the same variant that is so common in Eurasian populations. So evolution has clearly consistently favored this mutation. While hundreds of genes control observable traits like height and hair color, GDR5 has no doubt significantly contributed to variations in human height. The added risk of arthritis presents a paradox that Kingsley says is not uncommon in genetics. Often prevalent genetic variants that were advantageous in the past have deleterious consequences that appear later in life. For greater fitness earlier in life, late onset health issues like obesity, diabetes, heart disease, and arthritis have been inadvertently selected for. “We’re seeing an impact of evolutionary history on current human health that shows why a better understanding of this variant is important,” Kingsley said. Technology has reached the point where genetics and genomics can find the molecular basis of various traits, but there is still much work to be done in examining the human genome and making associations between specific genes and traits. However ambitious this exploration might be, Kingsley expresses confidence that the scientific community is making strides in its examination of the human genome. “We’re making progress one centimeter at a time,” Kingsley said. Contact Emma Cockerell at emmamc2000 ‘at’ gmail.com. Correction: This article has been updated to reflect the correct time of human migration from Africa into Eurasia. A previous version of this article stated that this migration took place 60,000 years ago. The Daily regrets this error.